The museum is set out over several levels, but the original structure of the building as a railway station is also preserved. The central area has specially constructed rooms which contain paintings and sculptures, but there is also a level on the roof of these rooms too. Further levels make use of the old Gare Orsay rooms, some of which are beautifully ornate. It’s like walking through a stately home rather than a museum at times with stunning chandeliers and luxury wallpaper. The large glass wall at one end of the main hall has lots of offices behind it, but the walkways behind the glass on each level still make you feel like you’re in a railway station. We were also particularly struck by the main roof of the building which is beautiful, and by the cafe which is behind one of the exterior clocks. There’s no doubt that the museum exhibits are worth seeing and we enjoyed looking at them, but for us, the best exhibit here is the building and the way it’s been converted. 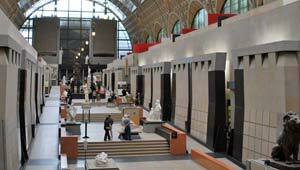 Musee d’Orsay is open every day except Monday from 9am to 6pm, with a late night on Thursdays to 9.45pm. Adult admission to the permanent exhibition is 9 Euros (2012 prices), although EU citizens aged 25 and under are allowed entry for free (you’ll need to take your passport though). You can also get free access to Musée d’Orsay with the Paris Pass. The museum is alongside the river Seine, roughly opposite to the Louvre museum. Please note that refurbishment work has prevented access to some areas in recent years, but this work is now complete. The nearest Metro is Assemblée Nationale or RER stop Musée d’Orsay.